This Certified Refurbished – Good Condition product has gone through an 18 point inspection process. It will have small scratches on the casing but the screen will be in good condition. It has passed the same functionality testing and is backed by the same 90-day warranty as all Certified Refurbished products on Amazon. The product ships with the battery, USB Cable and a charger and will arrive in a generic box. The iPhone 6 isnt simply bigger – its better in every way. Larger, yet dramtically thinner. More powerful, but remarkably power efficient. With a smooth metal surface that seamlessly meets our most advanced Multi-Touch display. It’s a new generation of iPhone thats better by any measure. 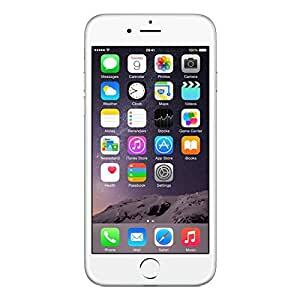 With a seamless, continuous aluminum and glass design, the iPhone 6 Retina HD Displays are the thinniest most adavanced Multi-Touch display at 4.7 inches. Enjoy the A8 chip with a 64-bit architecture processor, not only faster than the A7 but up to 50% more energy efficient too.